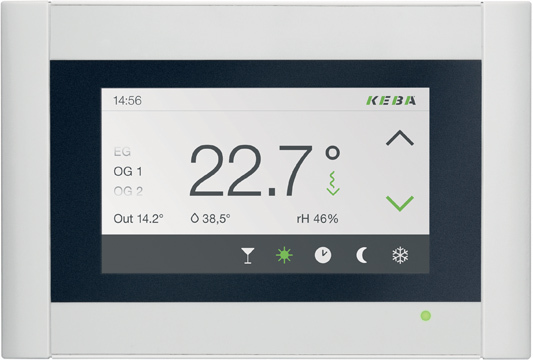 As a complete package, the KeEnergy h1000 heat pump control offers an outstanding combination of hardware and software for your heaters. 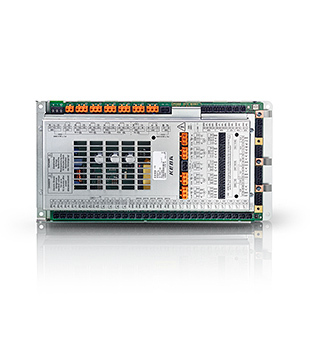 The hardware is of industrial quality; the individual components are connected via a fast serial bus and are freely expandable. 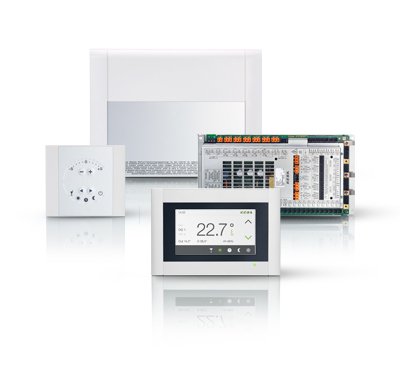 Software packages that are optimally matched to one another facilitate fast and individual creation of a new heating application. 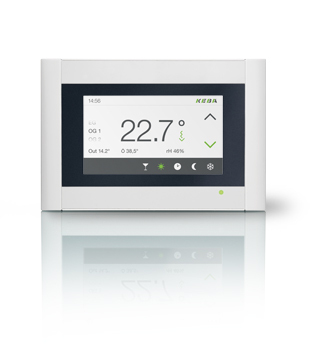 The AP420 operating unit with integrated control is installed either directly in the boiler or in a living room. It is used, on the one hand, for visualization and operation and, on the other hand, for the control and regulation of the entire heating system. The high-resolution, graphics-capable 4.3” color display with intuitive touch operation offers convenient operation for the end customer and the service technician. 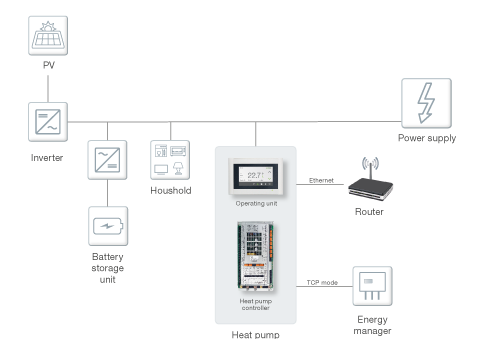 The heat pump controller contains all necessary hardware interfaces for operating a heat pump. Through the use of TRIACs with 230 V outputs, any contact problems of relays during start-up operations are completely avoided. Because there are a sufficient number of TRIACs, additional relays can be avoided in many cases. This saves considerable hardware and wiring costs. The heating circuit module is used for the automation of the heat distribution and supports a large selection of hydraulic schemes. It includes actuators and sensors for two heating circuits, a hot water tank, a buffer and a thermal solar system. 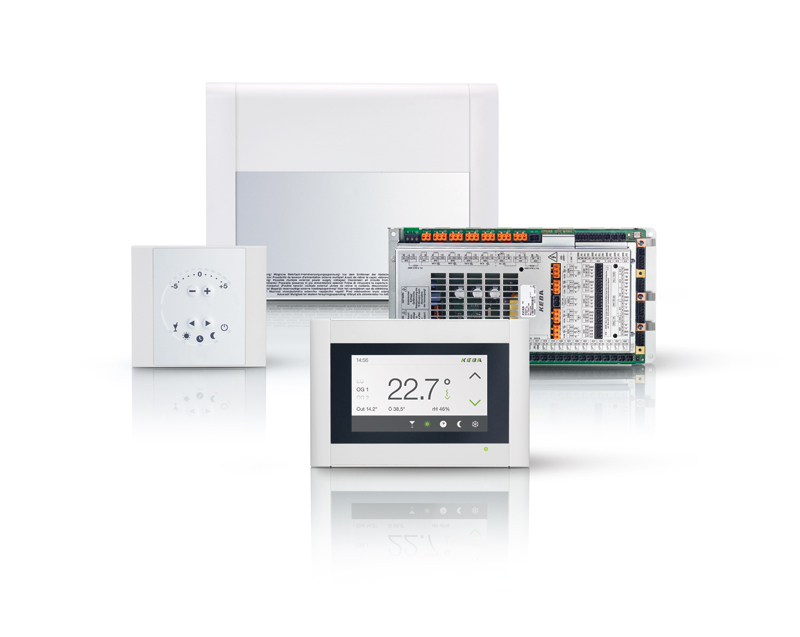 An especially simple connection technology, a convenient wiring compartment and many cable entires facilitate fast and simple installation of the heating circuit controller. 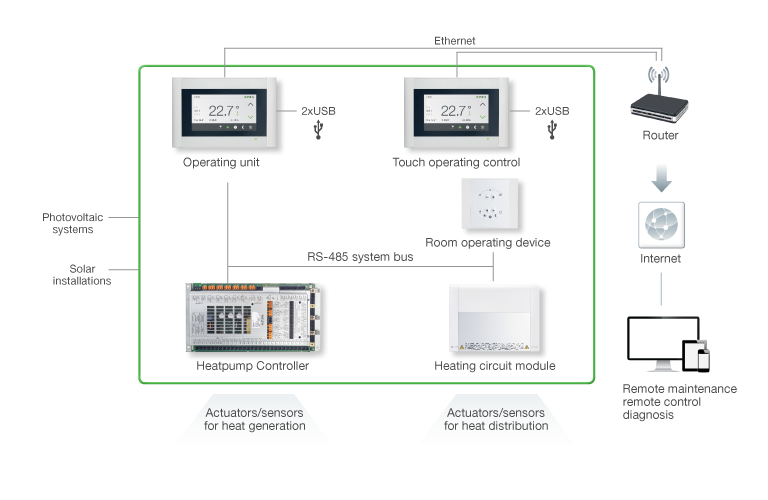 The OI420/OI423 room controllers enable convenient adjustment of the desired room temperature and the operating mode of the heater right from the living room. 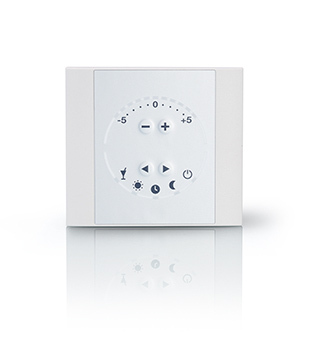 Both the room target temperature as well as the operating mode are set using easy-to-operate buttons. The remote control is available in two versions: the standard version as the OI420 wired version and optionally as the OI423 radio version. The model-based overheat control very quickly ascertains the correct initial position of the electronic expansion valve and stably controls to an optimum seasonal performance factor with a low overheat. Controlled by a KEBA heat pump control, the combination of inverter and variable-speed compressor achieves energy savings of up to 25% over standard fixed-speed compressors. The characteristic field monitoring developed at KEBA for variable-speed compressors guarantees many years of stable compressor operation in accordance with the specifications of the compressor manufacturer. Other energy efficiency improvements are made possible by speed control of heating circuit pumps and source pumps. By evaluating the difference between the flow and return temperature, the pumps are always controlled exactly to the required flow rate. Optimum use can be made of the self-produced electricity for the heat pump by means of the combination of a heat pump and a photovoltaic system. Utilization of the locally generated regenerative energy therefore increases, and the amount of electricity drawn from the mains can be reduced. The KeEnergy control system has a Modbus TCP interface and can thus be easily integrated into higher-level management systems. This provides the information about the infeed of surplus power into the mains. 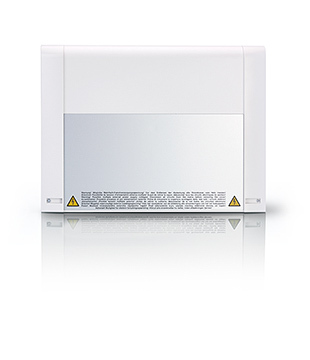 Alternatively, the heat pump can be integrated using a smart-grid-ready interface or an S0 pulse counter. With variable-speed systems, the compressor power is controlled to the current mains surplus power, which significantly increases the utilization of the PV energy. At the same time, operation is kept within the compressor characteristic field. The energy use is also optimized by integration of weather forecasting.